Share your photos on Instagram with the hashtags #badmintonskort and #oliverands. 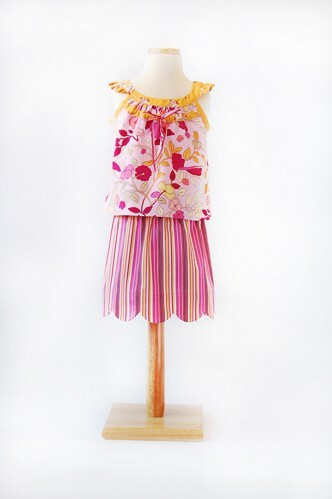 Girl's skort, top, and dress pattern. Matching shorts are hiding underneath the scalloped hem of this skort. 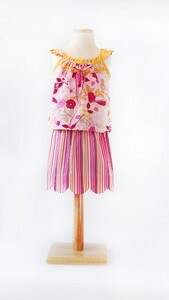 The coordinating top includes a curved yoke, ruffles at the shoulder, and a ribbon drawstring detail at the front. 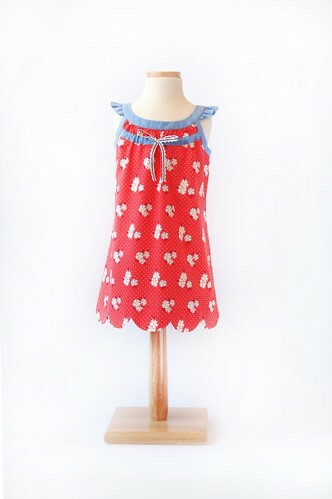 The top can also be made as a dress with a scalloped hem. After successfully sewing this pattern, you will have developed the following skills: curved seams, external facing, and gathering. Skort Hip 21" 22" 23" 24" 25" 26"
Skort Length 10 3/4" 11" 11 1/4" 11 1/2" 11 3/4" 12 1/4"
Top Length* 8 1/2" 9" 10" 10 1/2" 11 1/2" 11 3/4"
Dress Length* 14 3/4" 15 1/2" 16 1/2" 17 1/2" 18 1/2" 19 1/2"
Skort Hip 27 1/4" 28 1/4" 29 3/4" 30 3/4" 32 1/4" 33 1/4"
Skort Length 12 3/4" 13 1/4" 13 3/4" 14 1/4" 14 3/4" 15 1/4"
Top Length* 12 3/4" 14" 15" 16" 17 1/4" 18 1/2"
Dress Length* 21 1/4" 23" 24 3/4" 26 1/2" 28 1/2" 30 1/2"
I made this skort for my 11year old granddaughter. It was for Easter so I used Bear Threads jacquard fabric in blue. I know that was a fancy fabric, but it turned out beautifully!! My granddaughter loves it!! For the top I used the butterfly top. Mothers of very young girls will certainly understand the reply - a heartfelt YES! - my DIL sent when I texted and asked if she thought the girls would wear a skort. They love the Sunny Day shorts and the Lazy Day skirts that I've sewn them, so this seemed the next natural step. As usual, every step in the process was explained. I decided to make a straight hem rather than the scallop, as I'm visually challenged, and ended up making four skorts out of leftover fabric. Such fun! My granddaughter asked just last night if I could make a skort for my grandson, too, so I guess they're a hit. 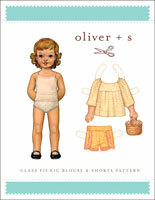 Thank you, Oliver & S! 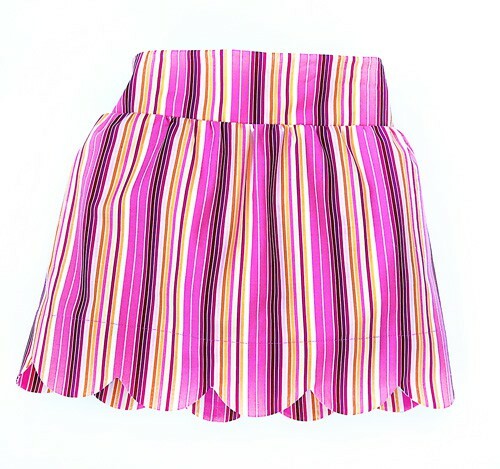 This is the second skort I've made for my 6 year-old granddaughter--by popular demand! She chose the fabric as well. It's hard for me to conceptualize a design like this, but I've found that Liesl writes perfect directions. I just have to follow them verbatim and it will work out! 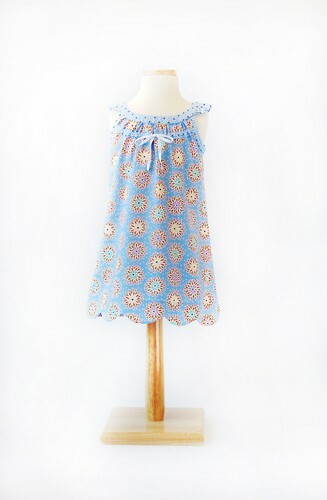 I just finished sewing the dress for my daughter (http://sewshewrites.blogspot.sg/2015/11/oliver-s-badminton-dress.html) with a modified hem and it fits perfectly. She's 2 but fits into the 18-24 month size according to the size chart. Although the neck and shoulder details are a bit time-consuming, the instructions are really well written and easy to follow. 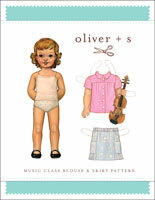 This is my 5th Oliver+S project for my children and I LOVE the patterns. Thank you! This top is really lovely when finished but it was really tricky to make. I found the neck opening to be too large so I sewed a smaller seam allowance of 3/8 inch instead of the 1/2 inch on the pattern. The top is best sewn over a few days rather than all at once. I have not sewn the skort yet but look forward to it with all the positive reviews. Made the dress to wear on vacation; it has the feminine details and nice finish dd has come to expect from o+S, with well-written directions. (Pic is in the Flickr pool.) Daughter loves the scalloped hem, which was easy to achieve neatly with the provided template. Have not made the skirt as patterned, but I found myself referring to the directions for it while assembling an A-line skort for dd's school uniform. Just shows that Liesl can guide you through anything. I found the skort relatively easy to make, and love the result. I've nearly finished the dress, but I was a bit surprised by how fiddly it was, considering the difficulty rating. It has taken a while to make and although the result is beautiful, and worth the effort, I couldn't make it in an evening! Hope to make many more of both though. I have this pattern in both size runs because it is just so adorable! I've made 5 or 6 of these. The skort is so much easier than it looks, and perfect for an active little girl! I do need to add some length to the blouse for my little girl. 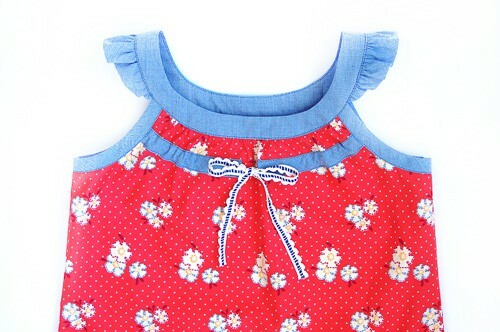 The neckline and ruffles take some time and patience, but look so fantastic when they are done! Done in knit, the dress would make a sweet little nightgown. I made the skort and dress. Both fit well and look really cute, however the yoke part was pretty tricky! I just finished the skort & top for my granddaughter. 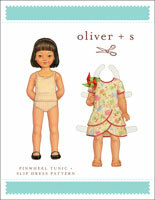 As an intermediate sewer, I find that Oliver & S patterns have the precise and detailed instructions I need for each step in making a successful outfit. I used Art Gallery's Skopelos in Paparounes Crimson from for the skort and an Anna Maria Horner voile solid pink for the top with Skopelos Melograno Pomeberry for the trim. Love how they came out! I made the badminton top for my granddaughter Samantha last summer. I used a variety of scraps that I had in black and white and red colors. The directions were clear as always. I paired it with a simple gathered skirt, and it turned out so cute! I am really excited about the skort. That's helpful when little granddaughters are very active! Love it. In the first printing of the paper version of this pattern, the instructions contained a minor error. On page 3, please add the following sentence to the end of step 4 under the section "Finish the Armholes": "Repeat this step with the top/dress back, stitching two rows of gathering stitches to the top raw edge." This error has been corrected in the digital version of the pattern that is currently available. Discussion on the digital badminton skort, top + dress sewing pattern from the Oliver + S Discussion Forums. Find and share more photos on Instagram using the hashtags #badmintonskort and #oliverands.